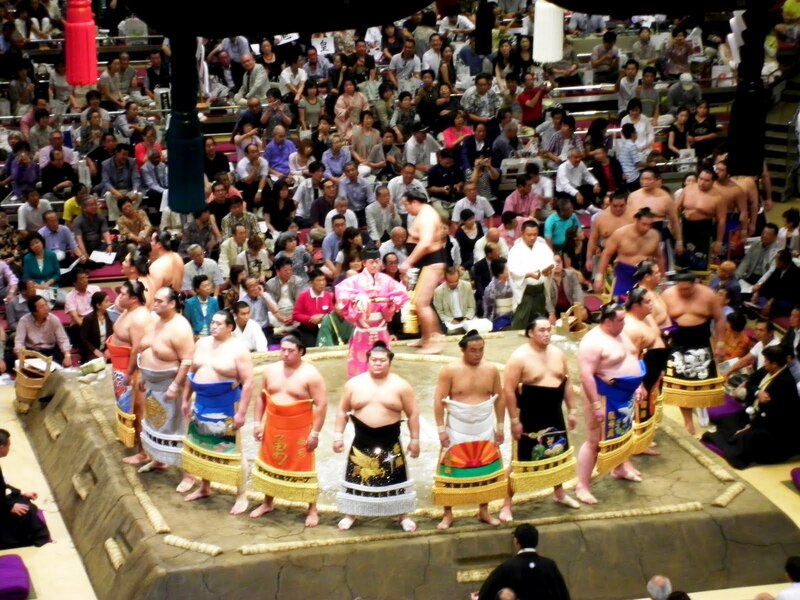 Six sumo wrestling tournaments are held in Japan every year and only three of those are in Tokyo. Seeing as I was in Tokyo when one of them was being held, I decided that it would be wrong of me to pass up a once in a lifetime chance to experience this quintessential Japanese tradition. I woke up bright and early to get to Kokugikan stadium in the Ryogoku district of Tokyo. Only a certain number of general admission tickets are distributed daily during the tournaments, so it was suggested that I get there around 8. I learned that the fights began at 9, but the big guys didn't start until mid-afternoon. And by big, I don't just mean size; the highest ranking wrestlers would be entering the ring in all their glory circa 3 o'clock and this ceremony was not to be missed. 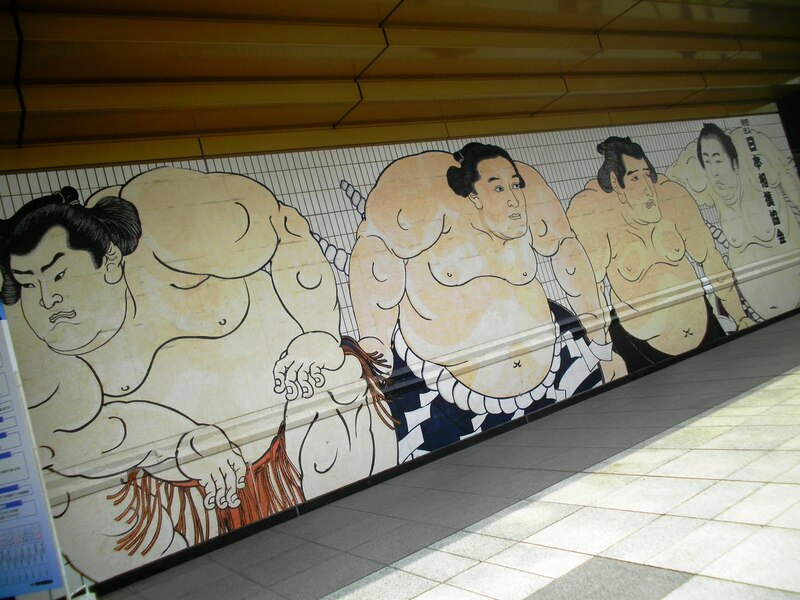 Murals depicting sumo wrestlers in traditional fashion at Kokugikan stadium. So, after getting my ticket, I headed out to Ginza for a couple hours, playing with all the latest gadgets at the Sony building, but my excitement (and the rain) got the best of me and I was back at the sumo stadium around noon. I was needing a snack and saw that I could taste a sumo staple, chanko. Considering the typical sumo wrestler's size, I had not imagined that exercise and diet was a part of their lifestyle. 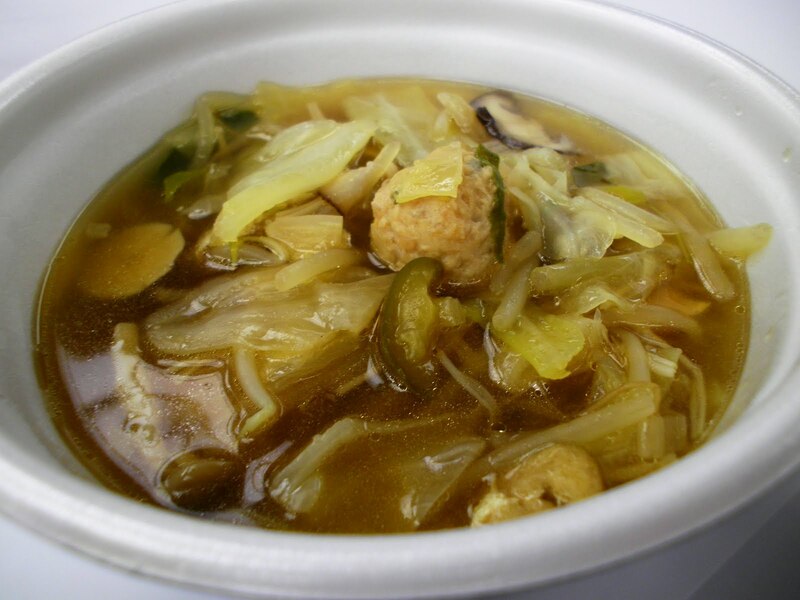 But, I was wrong, and there I was in a banquet room slurping down a bowl of a delicious "sumo wrestler stew" of meats and vegetables. Just as I was about to finish, a middle aged Japanese couple sat down beside me and we immediately started chatting. We quickly became friends and they invited me to sit with them in their seats, so I would have a better view; I referred to them as my Japanese mom and dad for the rest of the day. Chanko, a staple of the wrestlers' diets, made with meats and vegetables. 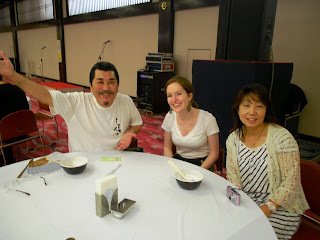 My Japanese mom and dad for the day and I enjoying our chanko in the dining hall. I was glad to have met the sumo fans, as they used their best broken English to explain to me the history, the tradition, and the process of the ancient sport. I learned that the very origin of the Japanese race depended on the result of a sumo match, at least according to legend. It dates back 1500 years and its foundation is religious. 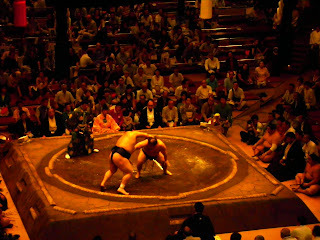 The first matches were a form of Shinto rituals, dedicated to the gods with prayers for a bountiful harvest; sumo matches were performed together with sacred dancing and dramas within the precincts of the shrines. It later became an important part of Imperial Japan, as well as a means of military efficiency. 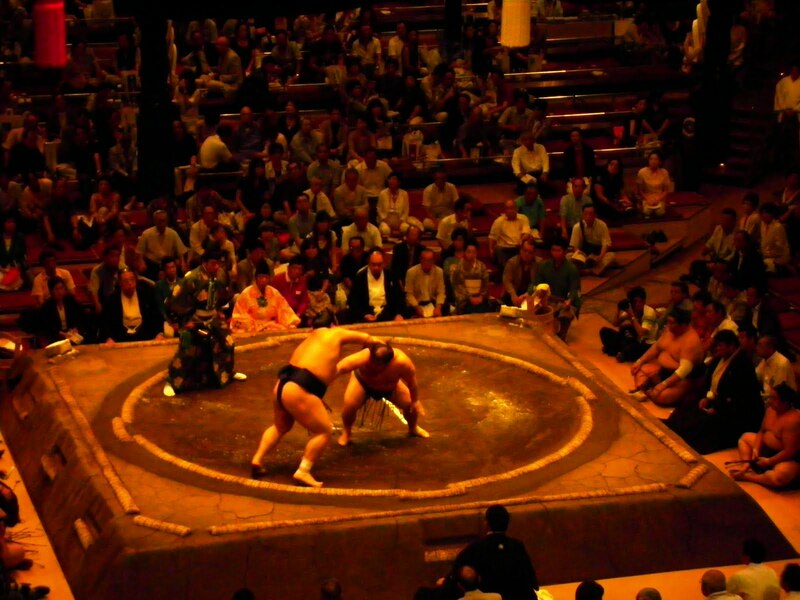 To this day, however, it's religious associations can still be seen in particular movements of the wrestlers, as well as in the Shinto-inspired roof of the dohyo, the sumo ring. Mom and dad pointed out every little detail of the matches as they made sure I had my mouth full of snacks and a beer in my hand. (Again, Japanese hospitality is unsurpassed.) While the matches were usually short, I found them quite entertaining. The objective of the wrestler was to push his opponent either out of the ring or knock him over so that any other part of his body was touching the ground. How he did this was his choice: by his fists, pulling hair, gouging eyes, choking, or kicking the stomach. No yellow card or fouls in this game!! There were a few times when the wrestlers flew off the ring and into the judges or VIP spectators. I might add that the bigger the boy, the harder the fall. I had expected the matches to be quite tame and monotonous, so I was happy to find that fans usually had a favorite player and were avid to cheer him on during the fights. There were even a few times when the champion of the matches was uncertain and as the judges deliberated, the audience enthusiastically chanted the Japanese equivalent of "Rematch, rematch!" I was talked into screaming loudly for Kyokunanki, a highly ranked wrestler and family friend of the Japanese couple. Nearby spectators laughed as I screamed loudly for him, no doubt screwing up the pronunciation of his name. But, I've become used to sticking out and being laughed at over my past year and a half living in Asia, so I laughed right along with them. 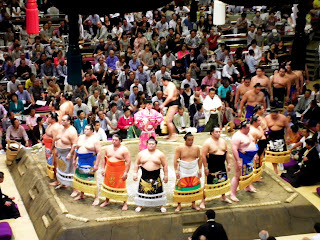 The highest ranking sumo wrestlers enter the ring in their brightly colored robes. Learning the traditional formalities and systematic ritual also added to the excitement of the matches. My friends pointed out that as the tournament progressed and the higher ranking fighters entered the ring, suddle changes were made to the apparel (or lack thereof) of the wrestlers and the gyoji, the colorful referees. Yes, even the referee plays an important role in the match, as they announce the wrestlers by singing their names and waving a traditional fan when it's time for a match to start. Higher ranked referees can wear the split toe Japanese socks and straw sandals, much like the highly ranked sumo wrestlers are the only wrestlers to have the iconic top-knot hair style. Wrestlers going at it in the ring. Even after the referee signals for the fight to begin, there is a period of time when the wrestlers put on their fighting faces and size each other up. They may pause to rinse their mouths out with water or repeat throwing salt onto the ring, a religious symbol of purification. There may be some more fighting or glaring and some sumo squatting and arm raising and grunting. When the cold warfare has come to a stop, the real show begins. One of the wrestlers is knocked out and a winner is declared. I was having too much fun when my new friends told me that I could meet some of the wrestlers outside. We headed out to find them, fortunately enough, covered up in kimonos signing autographs for starry-eyed children and giddy girls. It was fun snapping a few pictures with the wrestlers and my new friends were too excited for me to meet Kyokunanki. After the wrestlers paraded out, they offered to give me a ride back to my hostel, but said that they needed to drop off a gift for Kyokunanki first. Kyokunanki and I posing for a photo after his match. Headed toward his house, we found him and his apprentice/assistant, just as large as he, walking on the street. They, too, were offered a ride and soon I found myself in the backseat, sandwiched between these extra large, kimono clad sumo men on either side of me. I took a glimpse at both of them and had one of those "Is this really happening?" moments as my Japanese mom turned from the passenger seat, saw what an amusing sight it must have been, and let out a long string of chuckles. I only wish I had a picture to capture that moment, as it will no doubt remain with me for a long time. 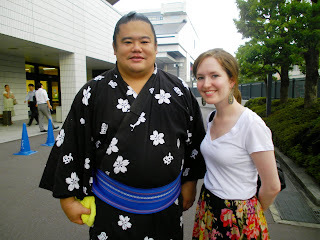 My day at the sumo stadium was no doubt an exciting one. I was able to experience the rich history and ritual of one of Japan's most treasured customs. Even more importantly, I never felt like the outsider that I was in the strange land of Japan, but rather a welcomed guest, one's own daughter for a day. I witnessed the warmth and sincerity of Japan's people and, even if only for a few hours, was a part of it's living tradition.